A graduate from the Faculty of Applied Arts MS University, Baroda, Mr. Deshpande has been working in the field of design for the past three decades. He began freelancing as a student, equipping him with a productive head start into the world of design and advertising. After working for Nexus Communications and then Panorama, his entrepreneurial instinct led him to set up his own business in design and advertising. He first established Tarang in 1987 and commenced full time work in 1994, building up his clientele purely through word of mouth. Mr. Deshpande overlooks every project, giving each assignment his personal attention and time, while specializing in packaging and design. His fondness for packaging assignments, he explains, is due to the excitement of creating something new, from scratch; the thrill lies in the potential for creativity and in the creation of something innovative and unique. 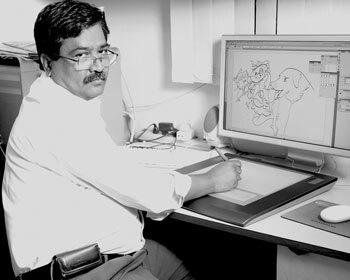 With a penchant for hand-drawn designs, Mr. Deshpande has nevertheless welcomed the age of computerization- bringing with it the speed and efficiency with which various ideas can be executed. Tarang was one of the first design firms in Bangalore to computerize their studio operations. During his off-time, Mr. Deshpande takes an active interest in drawing and photography.